From left, Mary Gerodetti, Melinda Jameson, Molly Smith and Laurie Bates stand in front of Red Creek trail, northeast of Durango, after a recent hike. The women are training for a 100-mile backpack to raise money to fight amyotrophic lateral sclerosis, better known as Lou Gehrig’s disease. Jameson and Smith are sisters, and their mother had ALS. Four great friends - all great hikers, as well - have finalized details for a 100-mile backpacking trip on the Colorado Trail to raise funds to fight amyotrophic lateral sclerosis, or ALS. The neurological ailment, also called Lou Gehrig's disease after the great first baseman of the New York Yankees, claimed the life of the mother of two of the hikers. Sisters Molly Smith and Melinda Jameson, with friends Laurie Bates and Mary Gerodetti, will step off from Stony Pass near Silverton on July 15 loaded with gear. Three days later, the four Durangoans will shuck their packs at Little Molas Lake to pile the gear on three llamas for the remainder of the hike. The hikers plan to emerge at the Junction Creek trailhead in Durango on July 24. "We're trying to find some meaning to my mother getting the disease," Jameson said. "We want to put our passion for hiking and our emotions over the situation with my mother to good use." Amyotrophic lateral sclerosis is a neurodegenerative disease, ultimately atrophying muscles that control breathing, mobility and swallowing, while leaving the mind unaffected. All donations will benefit the ALS Association - Rocky Mountain Chapter. Half of the money the foursome raises will go for patient care, the remainder for research. 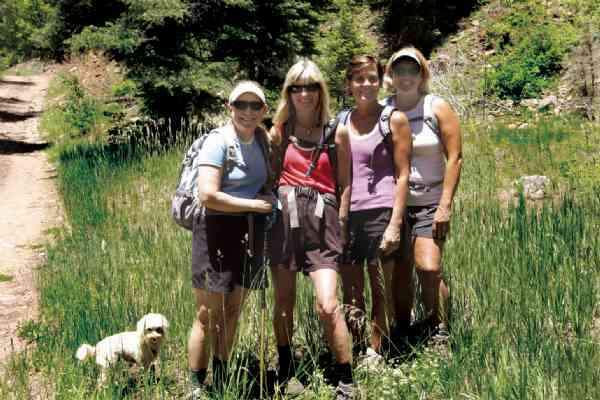 In November 2006, just after doctors diagnosed ALS in her mother, Elsie Follansbee, Jameson was hiking. The idea came to her on the trail, Jameson said, to follow the lead of some boys who had hiked a few years earlier to raise money for multiple sclerosis. Gerodetti, an anesthesiologist, said research could throw light on the relatively unknown disease. "Although some people exhibit 'soft symptoms' before the disease is diagnosed, there is no specific test for ALS. It's a diagnosis of exclusion - after everything else has been eliminated," Gerodetti said. "We don't know what causes it, so for now, there's no potential for treatment or cure. Without research, there is no ultimate hope." The goal of the hike is twofold, Smith said. "We want to raise funds because medical costs of ALS are horrendous," Smith said. "But we also want to raise awareness of ALS. Many people don't know what it is." Smith said the sisters told their mother, who died in March 2008 at age 77, what they were going to do. "We're passionate about this," Smith said. "We want to make a difference." Bates said the four women have been hiking together in the summer for perhaps 10 years but that the upcoming 100 miler is the longest. "I used to see Elsie when she visited from Pennsylvania and then, of course, after the diagnosis when she moved here," Bates said. "We want to do something in her memory and for the ALS cause." Gerodetti said the outing is a way to honor Follansbee's spirit and the joy she found in life. "It will allow us to celebrate Elsie's life and the incredible courage she showed," Gerodetti said. "She was always more concerned about how her care was impacting her family than about her disease." Donations to the campaign of four Durango women who are raising funds to fight amyotrophic lateral sclerosis may be made online at www.alsaco.org by clicking on "Ways to Give," then "100 Miles for Elsie & ALS" and then "Support this Event." Checks can be written to 100 Miles for Elsie & ALS and sent to the First National Bank of Durango, 259 W. Ninth St., Durango, CO 81301. A friend of the four women, Gloria Tarket, has made a 3-minute video about Elsie and ALS. It may be seen on the Web site above or on www.youtube.com by filling in the search terms.